Learn more about Yardscaping as Harold Johnson interviews Brie Arthur about her garden with an incredible mixture of landscape and edible foods, as well as diversity of pollinators and no pesticides. Listen to learn more about yardscaping! I was recently introduced to a new and intriguing gardening related term. As a guest of Brie and David Arthur I toured the gardens surrounding their home in Fuquay-Varina. That’s gardens with an “s” because Brie thoughtfully utilizes most if not all of her traditional landscape beds for growing food. There were edible plantings located where the typical homeowner might only plant shrubs; perennial and annual flowers; and groundcover. The areas included the boundaries with neighbors and the foundation border around the house. Her patio was surrounded with shrubs, tomatoes and dill; the fire pit and surrounding area was planted with blueberries, arugula among landscape plants; the front yard was bisected side to side with landscape plants and an edible fall crop that included corn and sorghum. This front yard planting provided the house a degree of privacy from the street, especially when the corn was grown. I was mesmerized by the vertical garden structure, on wheels no less, located by the house at the end of the driveway. Growing on one side of a 7-foot tall structure were colorful coleus while the opposite side was lush with edible plants. Happily I got to taste delicious carrots from the vertical garden. Each of the garden areas I describe contain edible plants or plants yielding fruit, berries or nuts that Brie then uses to showcase her culinary skills, especially for a favorite activity of hers, entertaining friends. Brie organically manages her gardens, using NO chemical pesticides. Her thought simple: why spray chemicals on food you’ll eat. After all, leaves with insect damage don’t affect the taste of the food. A benefit of allowing nature’s predator insects and not chemicals to help control pests is an abundance of pollinators working in the gardens. Brie welcomes pollinators of all shapes and sizes with a diversity of plants. You’ll see a variety of butterflies, wasps, bumble bees and honey bees in the gardens. The concept of “Foodscaping” is an example of thinking outside box as in a dedicated raised garden box. Why not utilize space already dedicated to ornamental plantings to grow vegetables, fruit and nuts? More on the nuts in a minute. If your growing space is limited, as are most of the recently built communities, take advantage of your growing spaces already dedicated to landscape plants. You’ll surprise yourself with how much you can grow when you begin planting along the borders of existing growing beds and among the existing landscape plants. In the Spring Brie plants peanuts, yes edible peanuts, along borders of many of the landscape beds. In the fall, pull them up, dry and roast them for snacking. In the fall when the peanuts are harvested, she plants garlic in those same areas for a later harvest. Some border areas might have lettuce for yet another edible crop. Please don’t get the impression that Brie advocates turning all your yard into gardens of food sources. To quote her, “Turf in moderation is extremely important.” Grass completes the scene of many textures and besides, it also helps keep ticks at bay. Brie takes an active role in green industry organizations: a regional director for “The Association for Garden Communicators”; serves on the executive committee for “International Plant Propagators Society”; and founded “Emergent: A Group for Growing Professionals”, a forum promoting the value of plants, gardening and all things horticulture as the way of the future. 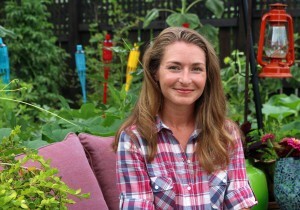 She also is the “Foodscaping” and Landscape Design correspondent for PBS’s “Growing a Greener World”, a TV program providing practical advice on integrating edibles in a traditional landscape. I hope you’ll enjoy listening to Brie share her thoughts on adding “Yard to Table” to your garden planning. Please enjoy and learn more on the concept of “Foodscaping” as you listen to my conversation with Brie Arthur. We just did a tour of the most complete diverse mixture of landscape and edible foods in Brie’s garden. Brie, what’s the catchword that you like to use? Not farm-to-garden, farm-to-table, but? Yard-to-table, “foodscaping” is the yard-to-table model. “Yardscaping”—that’s the term more people should remember because it’s not many people who don’t have either a vertical space, as in a townhome or condo, or some flat yard space. Tell me about some of the edibles that you’ve planted amongst your more permanent landscape plants. Well, my favorite trick with growing edibles is to use the edge. The edge of the landscape is really powerful. You know, right now the edges are full of mixed borders of peanuts which, of course, are a legume. The fixed nitrogen–they’re naturally providing nutrients to the plants surrounding them. Peppers and small leaf basil are some favorites for the summer edging. These things have just replaced the garlic, which I was telling you keeps the voles out of my beds, because I have a lot of in-ground mammals. So anything that will help keep the voles and moles at bay is always welcome in my garden. You put garlic in later? I do, I plant my garlic generally between Halloween and Thanksgiving. And that’s really as my beds are transitioning from the warm season to the early cool season. The garlic grows all winter long. I plant it just along the edge in solid borders. Last year it overcompensated! Ha ha! I planted 360 cloves of garlic because I said, “Well, we eat garlic every day.” And not thinking that turns into 360 bulbs of garlic, which are then composed of 10-15 cloves! Ha ha! So I grew enough garlic for most of Fuquay Varina! So that shows the power of the bed edge—its square footage and how much can be grown in the spaces that everyone basically already has. You have a house situated on about an acre, but part of it is not usable because it’s some wetlands, plus you have a house sitting in the middle of your acreage, so you’re able to with various garden rooms and garden areas have a lot of edging. Yes, I think when you’re designing a property, particularly a property when you are trying to make it productive, having beds that dissect the space are more efficient. They’re also far more accessible. You know, we’re here in the suburbs, so I don’t want to try to be a farmer; I want to have a beautiful landscape that just happens to also provide nourishment. These bed edges are cut in—it’s a designed property—it’s all on a piece of paper. These bed edges and the dimensions of the turf space that dissect them are really based off the mechanics of how to manage the garden, so everything is passable with a truck and trailer, so getting soil and mulch to the site is easy. I think, too often, we are a little thoughtless, particularly when we want to grow food and we till up this giant rectangle and pretend like we are a mini farm and we actually reduce the amount of space we can grow on. I am physically gardening the square footage of exactly ¼ of an acre. We have an acre total, a half-acre of a woodland swamp and then the rest of the sunny space is really between turf and landscape. Gotta go back to your current edging plantings. They’re beautiful! They’re colorful. The flowers on peanuts are absolutely spectacular. So, you didn’t give up any ornamental splash; you’ve got it, but with an edible! Absolutely! And there’s no reason you can’t also have ornamentals mixed right in along with those edibles. You know I love to see calibrachoa pop up along with the base of purple basil. I think that by integrating the edibles and ornamentals, you’re adding this level of biodiversity that is really required to have a functioning ecosystem, and often food crops aren’t biodiverse, so you really need to have them incorporated with plants that represent other genera and multitude of plant families, so that you truly embrace biodiversity from the plant level, which ultimately leads to a healthier ecosystem, not only for insects, but for amphibians and well, mammals! HahahahaI! I didn’t count how many plant families, but you’ve got 25, 30, 40 different plant families represented. …basically in every bed. Yeah, now I’m spoiled that I’m a propagator and I know how to create plants very efficiently and I haven’t had to buy all of this. This would be a very expensive landscape if I had to purchase all of the plants in it! There aren’t many homeowners that would garden to this extent. You are a poster child for lots of garden spaces. The average homeowner might have 1/10 of what you have. Well, and that’s really my goal here is to garden every square inch that is reasonable, but look at it each as a zone or a specific design strategy that somebody else then could apply that one piece to something, you know, like a property border or a foundation landscape or the mid-section that I use as my greens bed that really just dissects the front yard in half and makes our front yard feel more private because there’s a planting between the front porch and the road. You know I have to be a crazy person to want to actually want to manage this amount of square footage, but the goal of all that I do here is really to show what’s possible and then take that and apply it to other people’s properties and really to help engage the landscape professionals so that they may be able to someday provide this service that homeowners could access where their landscaper was integrated into producing food on their property, but not in a “farmy” way. In a pleasing, HOA approved landscape. Everybody wins when we look at this dynamic in an esthetic but still functioning way. Not just functioning from the aspect that you are growing food, but the land management that’s applied because people see the value of working organically grown produce. Too often our commercially managed landscapes are grown with hard chemistries that are, frankly, not really necessary if they were to invest in the soil and understand the ecology that exists within a landscape. So by the addition of edibles, people all of a sudden feel this emotional connection to that food and understand, “No, I don’t want you to put pesticides on it because I’m going to eat it!” And that suddenly makes the whole project, the whole landscape managed in a more ethical and longstanding fashion. You have mixed tomatoes, eggplant, peppers, tomatillos, I don’t know what else I saw besides wheat and rice. And you actually harvest the wheat and turn it into flour. Last year you had 25 pounds of flour from what wheat you had in your little plantings here and there. That was 850 square feet of wheat! Every property in this neighborhood has a spare 850 square feet. What that project has really gotten me focused on is figuring out how to incorporate grains in local carbohydrate sources in a meaningful but stylish and engaging way. That ultimately, that flour, grown in suburban landscapes could go to my local bakeries and they would have a local organic option for flour. That’s something that I have never lived in a world where having local carbohydrates was accessible and I want to change that. I think the local foods movement can’t just be about seasonal produce. It has to be about the nitty gritty and whether you’re eating carbs directly or the animals you eat—one way or another—carbohydrates are a part of every human being’s consumption. That needs to be addressed. We need to raise the bar on having organic and local sources every day. …the good and the bad! Here’s how it really works! I keep feeling bad that I never transplant that one hedge of Pink Lemonade, which is a wonderful, wonderful blueberry. But it’s underperformed because of that rich, organic compost that you saw that arugula does so well in that space; it’s generally a really fruitful part of my garden, except for the blueberries. Planting in a trough of pine bark really is the solution. A lot of times people want to plant blueberries along foundations. And one of the challenges with that is the lime that’s leached from your mortar. Though, I still am leery of planting blueberries adjacent to a sidewalk or a foundation, I think with the forethought of digging a large trench and really filling it with ground pine bark, that could at least help you get a good start in getting blueberries established in more alkaline conditions. You know, these are the things you see—the experiments that people need to see so that it clicks—it makes sense. You didn’t suddenly wake up one morning and know everything you needed to know about sustainable food, farming on your property. How did you come about it? You know, this is the thing that makes gardening so fantastic and wonderful and the best pastime we could ever have is that every day you learn because you are engaging in the space and you’re paying attention. It’s your job as a gardener to look and see and hear and feel what the garden is doing. That’s such an incredible extension of life’s purpose. I can’t imagine existing on this planet without being able to manage a piece of earth in a creative way. I think that we, for too long, haven’t been talking about. Gardening isn’t no maintenance, it’s fabulous maintenance. It’s the most allocation of your time; it’s creative and physical and you get instant gratification and you get to wait and see results—long term. It embodies everything that is wonderful about being alive! Everyone needs to get that! It’s so—it’s such the most fantastic addiction that we could be able to be blessed with. You know, that’s the thing. This is a lifestyle; it’s what makes being alive and enjoying the everyday possible, because the little moments can be appreciated when you’re a gardener. As we walked around, I saw butterflies, I saw the chrysalis stage, and I saw the caterpillar stage. You must not be spraying lots of pesticides. Zero pesticides! Zero pesticides! You know, for a long time in my career, I held a pesticide applicator’s license because it was necessary working as a propagator and grower at a nursery. I’m truly offended that that is our standard because what we are doing is copping out of understanding how to biologically get around the challenges. Spraying pesticides is not acknowledging ecology. You can grow very successfully allowing insects to be a part of your system. To me, human beings have way too much in common biologically (laughter) with insects and we want to acknowledge there are a lot of pesticides in the market that haven’t been out long enough for us to truly understand long-term implications and I’m simply not willing to subject myself to the potential of future illnesses because the bio-chem companies need to survive in a tough economy. I think there’s an opportunity for all of these industries to acknowledge that suppressing nature is not the solution for living on this planet, and I hope to see that happen in my lifetime. But it’s shameful that the nursery industry—and it’s really just 60 years’ time—has become so synthetically driven and dependent that they feel it’s impossible to grown any other way. This is an example that it is not impossible. …exactly! I think maybe we need to all switch our filters. My husband laughs because I wear Maui Jims—the sunglasses—and the world is more beautiful looking through those sunglasses. I think of that as an analogy of how we determine beauty in a garden setting. Yeah, my eggplants have flea beetle damage from the dry god-awful hot summer that we’ve just kind of broken through. But that has absolutely no impact, whatsoever on plants’ ability to photosynthesize and set fruit and ultimately, I think those leaves tell a story and are kind of lacy and beautiful if you want to look at it as not being perfect. Maybe we need to redefine perfection in the landscape and understand that maybe it’s perfection because those flea beetles come and that feeds a whole slew of other insects that make my garden function and that all of these things have a place. And get over it, get over it—get over yourself! It’s a piece of art! You know, maybe that is a great photobook to suggest—turn your filter and getting close ups of leaves and then what the plant actually looks like—that’s brilliant! Ha ha ha! …eaten leaves and art in the garden! Insect art! I have a minor in entomology. I feel so lucky that I was introduced to that, because I think a lot of the university programs have shifted since I was in college 15 years ago, but having entomology as part of my awareness has always driven how I wanted to garden because I had some professors that loved insects so much more than humanity and rightfully so. Our species wouldn’t exist if it weren’t for insects on this planet. Maybe in some ways people need to chant that in the mornings before they call the Orkin man and create a dead system in the space that they interact in. Insects to me are really what create that ultimately sense of place. You go to different regions and you have different insects and that’s just as remarkable as different mighty trees. Insects were here before any of us! And they’ll probably outlive us, too! And that’s not just the cockroach! After listening to my conversation with Brie Arthur I hope you are intrigued by the Foodscaping concept and begin planning your mixed gardening beds of ornamental and edible plants. More of my conversation with Brie will be posted soon so please return for more on “yard to table.” You have been listening to “Getting Dirty in Your Garden” brought to you by North Carolina State Extension Master Gardener Volunteers. You may find this and future episodes on our website: gettingdirtyinyourgarden.org. Until next time, why not go out and get dirty in your garden? • What Should I Do About Caterpillars?